GREEN BAY — The big mystery of the week has been solved, and the answer is Christian Ponder. Vikings rookie QB Teddy Bridgewater has been declared inactive for tonight’s game against the Packers at Lambeau Field due to an ankle injury, so Minnesota will turn its offense over to Ponder, who began the season as the team’s No. 3 QB behind Matt Cassel and Bridgewater. Cassel is out for the season with a foot injury, and Bridgewater made his first NFL start last week, leading the Vikings to a victory over the Falcons. Ponder has started the last six Packers-Vikings meetings in the regular season, dating back to his rookie year of 2011. The only matchup he missed in that time was the 2012 NFC Wild Card playoff game, when he was a late scratch due to an arm injury sustained the previous week against the Packers, a game Ponder and the Vikings won to get into the playoffs. Joe Webb started the playoff game in Ponder’s place and the Packers won, 24-10. That Minnesota victory in the 2012 regular-season finale at the Metrodome is Ponder’s only win over the Packers. He also was the QB for last season’s tie at Lambeau Field, making him 1-4-1 in his six starts against Green Bay. 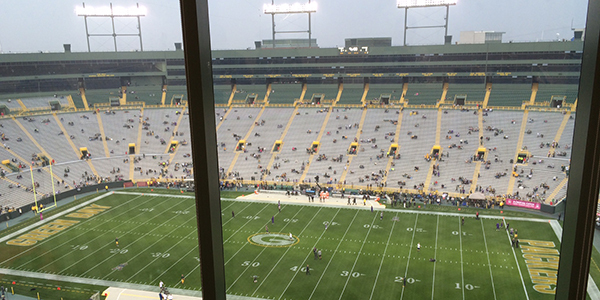 Weather update: Thunderstorms are in the forecast for Green Bay tonight, but they may not arrive until after kickoff. It has been drizzling off and on during the day, and the thunderstorm chances go up throughout the evening. Temperatures are in the low to mid-60s with light winds. In the NFC North: The Packers and Vikings both come into tonight’s game at 2-2, tied with the Bears and one game behind the first-place Lions. The winner of tonight’s game could finish the weekend tied for first, should the Lions lose on Sunday to the Bills. At worst, tonight’s winner will be tied for second place, possibly with the Bears, who play the Panthers on Sunday. League leaders: The Packers’ top two receivers are both at the top of the league rankings in different categories. Jordy Nelson leads the NFL in receptions (33) and yards (549) through four games, while Randall Cobb is tied for the league lead in TD receptions (five). The last time a Packers receiver led the league in both receptions and yards for an entire season was 1992, when Sterling Sharpe did it. It was much more recent the last time a Packers WR led the league in TD catches. That was 2012, when James Jones did it. Been a long time: The Vikings are without RB Adrian Peterson for a Packers-Vikings matchup for the first time since 2006. They’ll feature RBs Matt Asiata and Jerick McKinnon tonight. Who was the last Minnesota feature RB for Packers-Vikings not named Adrian Peterson? Click here to find out.